* For this event, Mixed Media is defined as stamps + ink, plus two other elements which add texture and/or dimension. This tag was inspired by one I saw on Pinterest. Pale green ink (Old Paper Distress Ink) was sponged over a harlequin (diamond) stencil and then two shades of brown distress inks (Antique Linen / Brushed Corduroy) were sponged around the tag, fading it out towards the center so the diamonds were still visible. A border of vines were stamped around the tag (second generation stamping with Brushed Corduroy ink) and the sentiment was stamped in Vintage Photo ink. The bird (perched reed bird die from memory box), branch, pine sprig nest and tab at top of tag are all die-cuts with sponged edges for interest. A red and gold ribbon was added to finish the tag. For details on how Shery made this gorgeous tag below, please click HERE. Awesome tag Shery ... thank you!! 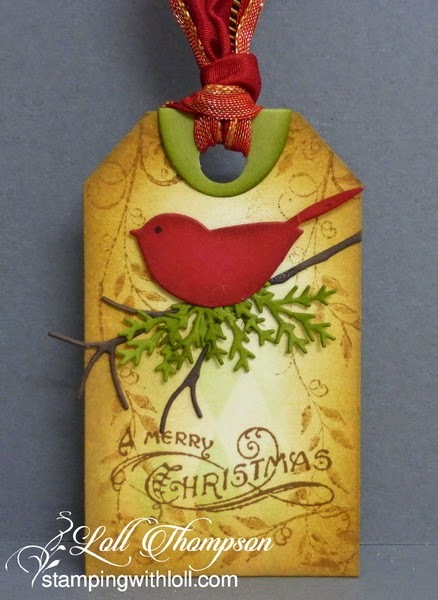 I hope you'll join us and link up your mixed media Christmas tags below. The event is open until Nov. 16, so there's lots of time to play along. Everyone who enters a mixed media Christmas tag(s) is eligible to win. The Top Tag will be picked by an independent judge. See you tomorrow with another Christmas Tag and special Guest Designer! 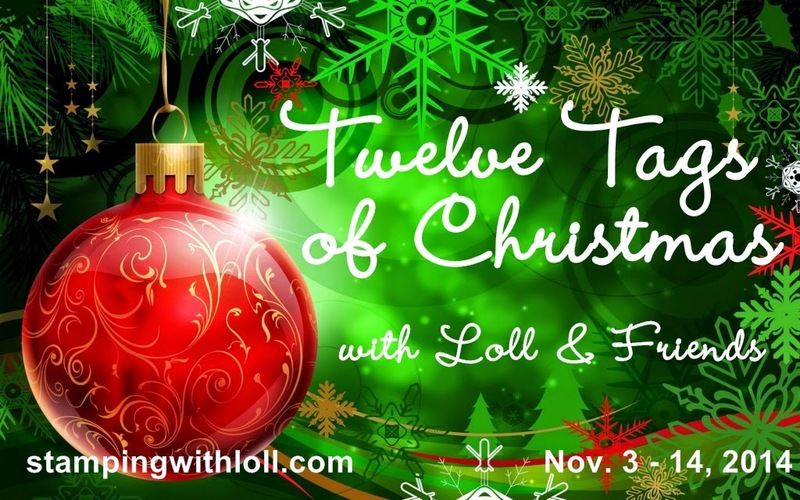 Come join our mixed media Christmas tag party! All the textures, distressing, colors and dimensional flower on Sheri's tag are a true work of art. Wow! your tag is especially pretty today, Loll! Hi Loll! Your tag is soooo adorable! Love the little birdie! The background is very cute! The background on your tag looks lit from within, Loll...and I love the sweet little bird! Awesome mixed media piece from Shery...fabulous background! Love this pretty red bird and the vines subtly stamped in the background! Love how you've added a layer to put the ribbon through! I'll have to remember that! I love this, Loll! The warmth of the color surrounding the bird is lovely and the vine enhances that warmth. I had been thinking that my next tag might be a bird, too - Great minds, as they say! Two works of art, filled with lovely colours, pretty textures, lovely layers, fabulous images. Gorgeous, both! Beautiful shding and design Loll! I haven't used that birdie for a while - must do it soon! 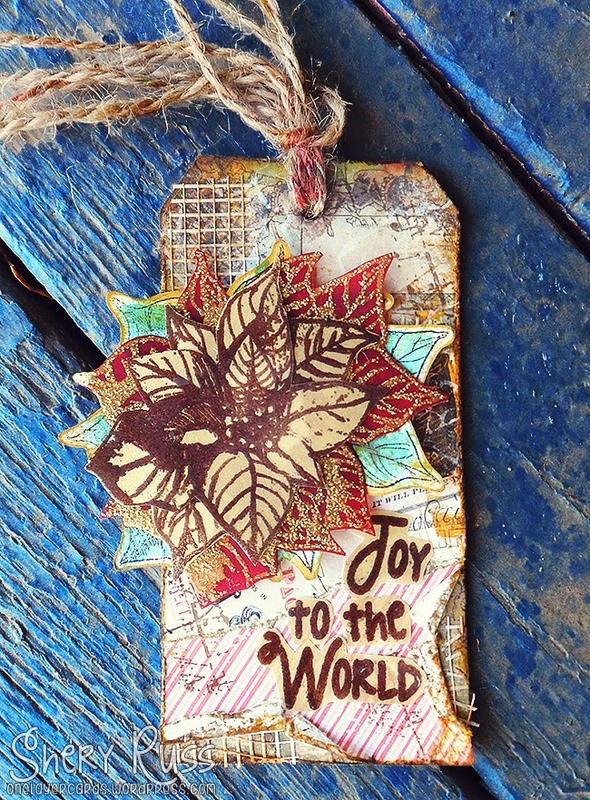 I love Shery's textured mixed media tag too! Beautiful tags and I am particularly fond of the traditional Christmas colors. And yes, I love fat red birds! Beautiful! Can you tell me what die brands the bird and tag are made from? Love your distressing techniques!